Inside Line has emerged with a report stating that the 2013 Cadillac XTS will make an entrance at the 2011 Los Angeles Auto Show. 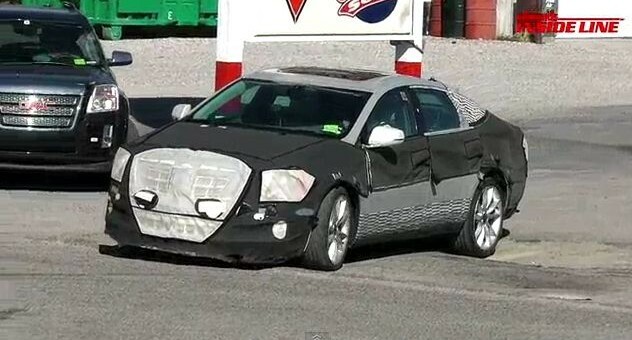 We can’t say this comes off as surprising, considering that there have been spy photos of the vehicle testing under heavy camouflage since early this summer, and that the Wreath and Crest went on to officially announce the first-ever CUE infotainment system, which is expected in the XTS when it launches in the middle of next year. We have a pretty good indication of how the car will look, thanks to the XTS Platinum Concept displayed in Detroit back in 2010, and expect some flavor of GM’s potent 3.6L V6 engine to power it as well. I look forward to seeing the XTS at the LA Auto Show next month. I sure hope it looks close to the concept XTS and gets as far away as possible from the DTS. Okay…you didn’t catch my drift. Let me explain. This is a Cadillac designed for a customer that it is actually not pursuing. In other words, the elderly. BUT I believe that it will not only appeal to the elderly, but to a very young and trendy crowd as well. It will be an unintentionally successful vehicle across the geriatric divide.